A well maintained AC unit will run more efficiently, use less energy, and cost less money to run. A properly maintained system will also last longer before needing to be replaced. Here a few simple tips that will help keep your system running throughout the long Tucson Summer. It’s all about the filter! Replacing your air conditioner air filter (or cleaning it, if you have a reusable filter) is one of the most important regular AC maintenance chores. It should be done every month during high-use seasons. When the filter becomes full of dust, dirt and allergen particles, the air flow will decrease, making your system work harder than it should have to. This slows efficiency and can take a toll on your energy bill. Check Your Thermostat: Check your thermostat to make sure it’s working properly. If you have an older, mechanical thermostat, consider upgrading to a programmable model. A programmable thermostat allows you to adjust the temperature in the house to be warmer while you are away and cooler when you’re home. This tip saves you energy and money. Keep the Unit Clean: Over time leaves, dirt, and debris build up on the outside of the air conditioner unit, decreasing system capacity and reducing air flow. 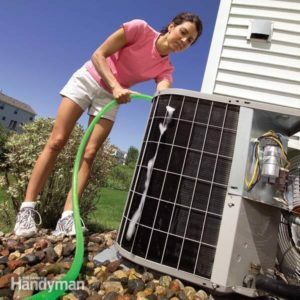 After shutting off the power to the unit, use a garden hose to gently wash out the debris, starting at the top with the hose at about a 45° angle. Do NOT use a power washer, and take care not to bend or damage the delicate fins on the coil. Inspect Wiring and Components: ALWAYS start your inspection by turning off the power to the unit, which can be done at the service disconnect on your outdoor unit or at the main breaker panel of your home. Next, remove the access panel on your condensing unit and look for signs of overheating – melted insulation on wires, blackened or burned-looking wires, etc. Then check electrical connections to make to ensure they are tight. Finally take a look at the contactor switch. If you notice excessive pitting, it’s time to replace the switch. Remember that Russett Southwest is here to help! If you see any of these problems and have questions or would like an expert’s help, give us a call at 520-629-9676 or schedule an appointment online russettsouthwest.com.